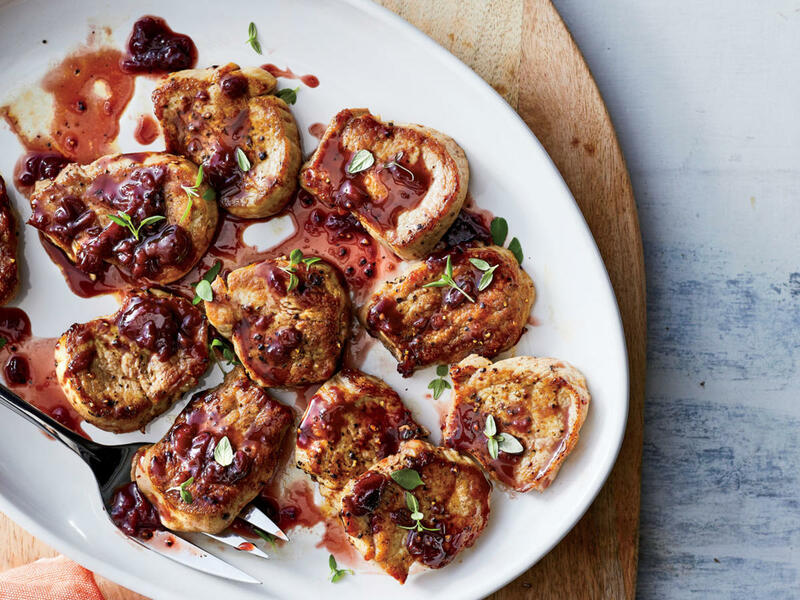 Simple to make and perfectly balanced between savory and sweet, this fast pan sauce uses a secret ingredient: cherry preserves. Heat oil in a large skillet over medium-high. Add pork slices; cook 2 minutes on each side. Remove pork from pan; keep warm. Increase heat to high. Add 2 teaspoons thyme to drippings in pan; cook 30 seconds. Add wine, salt, and pepper; cook 2 minutes or until liquid almost evaporates, scraping pan to loosen browned bits. Add stock and preserves; cook 8 minutes or until reduced to about 1/2 cup, stirring occasionally. Spoon cherry mixture evenly over pork; sprinkle with remaining 1 teaspoon thyme.